The Beatles Song of the Day is The End. 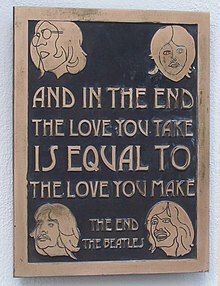 The End was written by Paul McCartney and is the last song in the medley of songs that takes up most of side 2 of Abbey Road. It would be the last song all four Beatles worked on together. The song was noted for the guitar solos each of the guitarists- McCartney, Harrison and Lennon took on lead guitar and the drum solo Ringo took, the only recorded one he took as a Beatle. He hated drum solos- so do I. The last song [unless you count that tagged on Her Majesty} on the last Beatles album recorded- The Paul lyrics “And In The End The Love You Take Is Equal To The Love You Make” is a good summing up of the entire Beatles experience. Paul McCartney: bass, piano, lead and backing vocal: John Lennon: lead guitar, backing vocal: George Harrison: rhythm guitar, backing vocal: Ringo Starr: drums: Uncredited: 12 violins, 4 violas, 4 cellos, 1 double-bass, 4 horns, 3 trumpets, 1 trombone, 1 bass trombone. Produced by George Martin. rating “The End” ***** as part of the medley- a classic. The End was never released as a single. Recorded on July 23, August 5, 7, 8, 15, 18, 1969. Spignesi and Lewis as part of the great medley rank it #36, Rolling Stone #23, critic Bill Wyman #22-29, The Beatles Channel Listeners Poll #4 and Jim Beviglia #2. One of the best lines ever in music.